We have tons of products in our inventory. Check out the 2019 Catalog below. 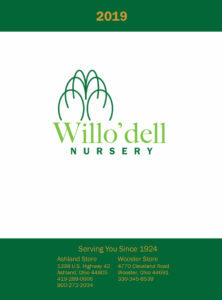 At Willo’dell Nursery, landscape design is what we do best. We should! We’ve done it continually since 1924 from Ohio to Florida. Check out our full 2019 Inventory in this downloadable PDF. Just click them image below to view or download.